NBC aired the three and a half hour 40th Anniversary special for their beloved late night sketch comedy series Saturday Night Live last night, and it was surely an affair to remember, with memorable appearances by comedians who got their start on the show, such as Eddie Murphy, Bill Murray, Tina Fey and Amy Poehler. Jimmy Fallon and Justin Timberlake kicked off the show with a memorable cold open, which is just one of many video highlights you can watch below, in case you missed the special or just want to relive it all over again. Saturday Night Live's 40th Anniversary Special was watched by 23.1 million viewers last night, making it the network's most-watched primetime program in over 10 years, excluding post-Super Bowl programs. The ratings were the highest since the 2004 series finale of ER, which was watched by 23.9 million viewers. Also, excluding the Super Bowl and major awards ceremonies, 40th Anniversary Special was the most-watched program on all of the major networks since a September 2011 episode of CBS' Two and a Half Men, where 28.7 million viewers watched Ashton Kutcher's first episode. Take a look at the video highlights below, which includes a reunion of The Californians, a new Wayne's World sketch with Dana Carvey and Mike Myers, a special Weekend Update with Tina Fey, Amy Poehler and Jane Curtin, a new Digital Short entitled "That's Where You Break" starring Andy Samberg and Adam Sandler and the return of Celebrity Jeopardy with Will Ferrell. Steve Martin, Tom Hanks, Alec Baldwin, Melissa McCarthy, Chris Rock, Peyton Manning, Miley Cyrus, Billy Crystal, Paul McCartney and Paul Simon debate over whether comedians, actors, former cast members, athletes, musicians or guys named Paul make the best hosts. 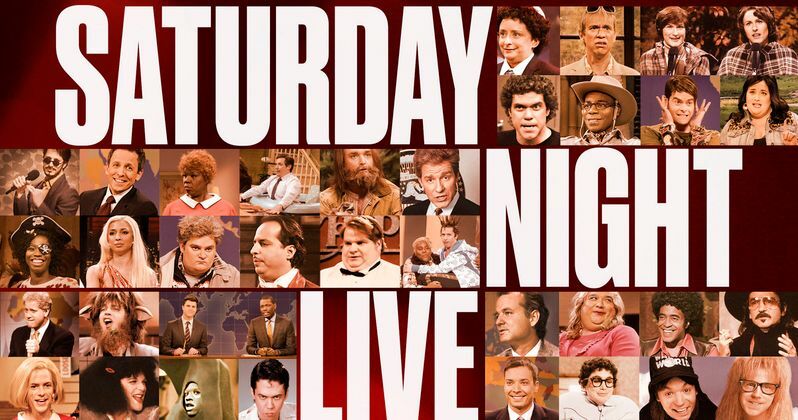 From The Chris Farley Show to Bronx Beat, SNL recaps 40 years of unforgettable sketches. The Super Bass-O-Matic is back, better than ever and it's got a brand new name: Super Bass-O-Matic 2150. Alex Trebek (Will Ferrell) tries his best to keep contestants Sean Connery (Darrell Hammond), Justin Bieber (Kate McKinnon), Tony Bennett (Alec Baldwin), Burt Reynolds (Norm MacDonald), Christoph Waltz (Taran Killam), Matthew McConaughey (Jim Carrey) and Bill Cosby (Kenan Thompson) in line. Pete Davidson and Leslie Jones introduce a supercut of auditions from former cast members like Gilda Radner, Bill Hader and Chevy Chase. Plus, see auditions from the stars that didn't make the cut. Robert De Niro introduces a supercut of sketches that pay homage to New York City. Keith Richards introduces Paul McCartney's performance of "Maybe I'm Amazed." Jack Nicholson introduces a look back at SNL's coverage of politics, including impressions of President George Bush, Sarah Palin, President Bill Clinton and more. The Californians (Fred Armisen, Bill Hader, Kristen Wiig, Laraine Newman, Kenan Thompson, Betty White, Taylor Swift) reunite and get some surprising news about their pool boy Craig (Bradley Cooper). Plus, David Spade and Cecily Strong bring the sketch to an abrupt end. Tina Fey, Amy Poehler and Jane Curtin return to the Weekend Update desk and share the latest news on SNL's viewership. Emma Stone answers reader letters as Gilda Radner's iconic character. Edward Norton tries to share his New York City club recommendations as Stefon but Bill Hader and Seth Meyers interrupt to show him how it's done. Melissa McCarthy plays the motivational speaker and reminds Tina Fey, Amy Poehler and Jane Curtin that being a Weekend Update anchor will not bring you jack squat. SNL remembers Weekend Update anchors Chevy Chase, Seth Meyers, Seth Meyers, Jimmy Fallon, Dennis Miller and more. Kevin Nealon, Norm MacDonald, Seth Meyers and Colin Quinn pay tribute to the Weekend Update anchor who paved the way, Chevy Chase. Martin Short and Beyoncé (Maya Rudolph) reminisce about SNL's musical acts with help from Garth & Kat (Fred Armisen, Kristen Wiig), Marty & Bobbi Culp (Will Ferrell, Ana Gasteyer), Opera Man (Adam Sandler), King Tut (Steve Martin) and The Blues Brothers (James Belushi, Dan Aykroyd). Chris Rock pays homage to Eddie Murphy, who calls returning to SNL a magical feeling. Derek Jeter and Peyton Manning introduce a look back at 40 years of sports sketches, including Bill Swerski's Super Fans, Boston Teens and Yankee Wives. Pete Twinkle (Jason Sudeikis) and Greg Stink (Will Forte) take a break from covering the action to advertise a feminine razor. Miley Cyrus - "50 Ways to Leave Your Lover"
Miley Cyrus performs a cover of Paul Simon's "50 Ways to Leave Your Lover." Jerry Seinfeld fields questions from audience members Michael Douglas, John Goodman, James Franco, Larry David, Tim Meadows, Dakota Johnson and Sarah Palin. Tina Fey and Alec Baldwin pay tribute to Tracy Morgan. Kanye West performs a medley of songs, including "Jesus Walks," "Only One," and "Wolves." Louis C.K. introduces a compilation of SNL's short films, including Mr. Bill, TV Funhouse, The Ambiguously Gay Duo and SNL Digital Shorts. Zach Galifianakis introduces a new Digital Short starring Andy Samberg and Adam Sandler. Bill Murray honors the dearly departed members of the SNL family. Mike Myers and Dana Carvey return as Wayne and Garth for a new Wayne's World sketch. Jack Black introduces Paul Simon and the Saturday Night Live band's performance of "Still Crazy After All These Years." Steve Martin wishes viewers a goodnight surrounded by all of the night's performers and SNL creator Lorne Michaels.